This is from LOST, when Hurley finds the car….right? Haha! That car will NEVER be the same again. Too bad, too. Looks like a pretty decent condition Rabbit. Hmmmm, sorry…. Maybe it’s a Fox. I had to do this once. My friend’s International got stuck when high tide came in. It took 3 4wd vehicles working in tandem to pull him out. Hey! Why are they takin the wale out of the water? DonÂ´t ! It will die! an International should take 3 vehicles to pull out. Don’t drive in the water dumbass. Its just trying to go back to the factory it came from. safety crew from the crown… Lol. That is what happens when you don’t tip the valet…. It could have easily happened in Venezuela. I AM ASHAMED!!!!!! NO WOMAN DRIVER JOKE!?!?!!?!?!? ok, i don’t have a witty one either. 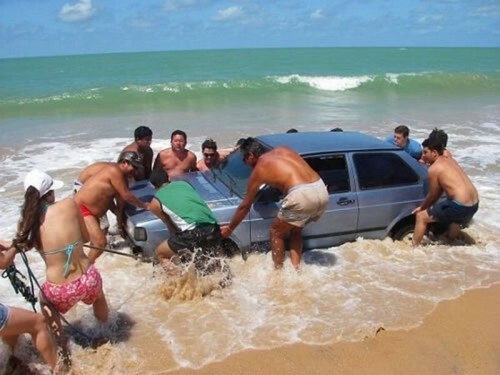 @traptin85: A woman may be a bad driver, but it takes a man to get stuck in the OCEAN!